Genetic variation and environmental variation are two types of variation, which can be identified in the offspring of a particular species. An offspring of a particular species inherit a set of characters that are unique to that particular species during reproduction. Sexual reproduction introduces new characters to the offspring via genetic recombination. The main difference between genetic variation and environmental variation is that genetic variation is the variation of the genotype between two individuals within the same species whereas environmental variation is the dependence of the phenotype upon the environmental factors. The genetic variation is the variation of genomes between individuals in the same species due to the genetic mutations that occur during sexual reproduction. Chromosomal crossing over is responsible for introducing new genotypes to the species. The genetic variation is an important mechanism, which forces the evolution through natural selection. It is important in maintaining the biodiversity among species as well. Genetic variation can be caused by mutations of genes, gene flow, random mating, random fertilization, and crossing over between homologous chromosomes. Random mating, random fertilization, and chromosomal crossing over lead to the reshuffling of alleles within a particular species. Mutations introduce new genes or alleles to the population. The skin color of a person, hair color, the color of the eye, freckles, and dimples are the examples of genetic variations within the human population. 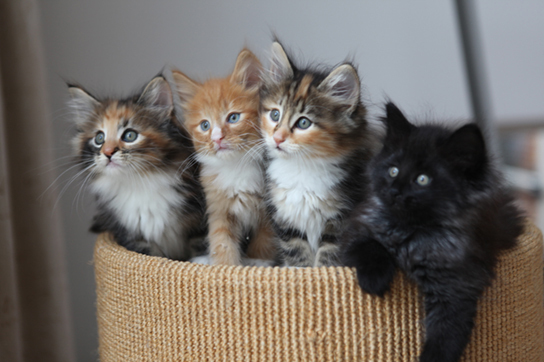 The genetic variation leads to the different coat colors of cats is shown in figure 1. 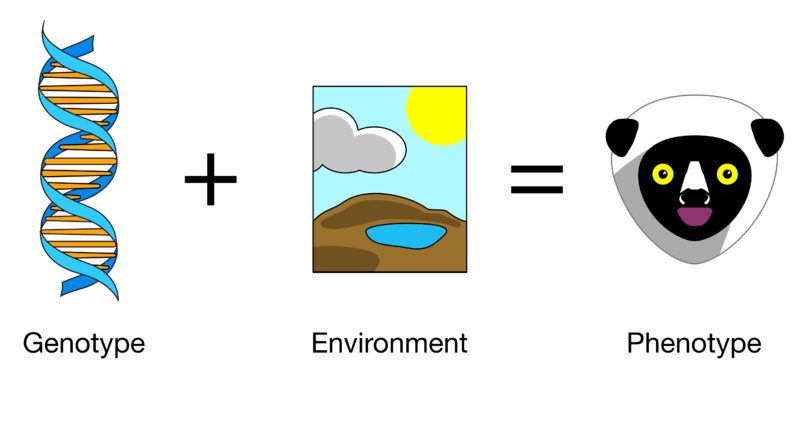 The environmental variation is the alteration of the phenotype of a particular genotype as a response to the environment. Environmental variation is also known as phenotypic plasticity. The environmental variation is mostly found in plants. The environmental variation is caused by the external environmental factors such as light, temperature, moisture, minerals, and the exposure to various other factors. Biological factors such as parasites may also cause environmental variation. The phenotype of animals depends on climate, diet, culture, and lifestyle. Any differences found within identical twins are the most precise example of environmental variations in animals. Effect of the environment on the genotype is shown in figure 2. Genetic variation and environmental variation introduce new phenotypes to the population. Both genetic variation and environmental variation allow individuals to survive in the environment by adapting to it. Genetic Variation: The genetic variation is the variation of genomes between individuals in the same species. 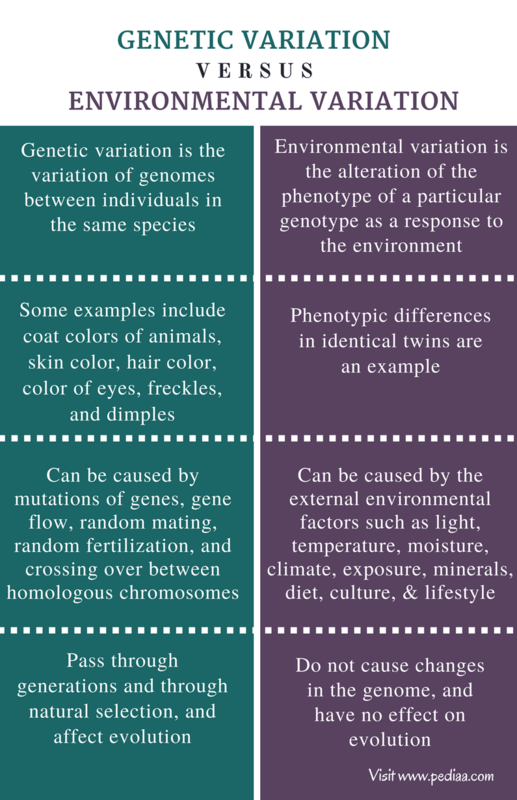 Environmental Variation: The environmental variation is the alteration of the phenotype of a particular genotype as a response to the environment. Genetic Variation: Coat colors of animals, skin color, hair color, the color of the eye, freckles, and dimples are the examples of genetic variations. Environmental Variation: Phenotypic differences in identical twins is an example of environmental variation. Genetic Variation: Genetic variation can be caused by mutations of genes, gene flow, random mating, random fertilization, and crossing over between homologous chromosomes. Environmental Variation: Environmental variation is caused by the external environmental factors such as light, temperature, moisture, climate, exposure, minerals, diet, culture, and lifestyle. Genetic Variation: Genetic variations pass through generations and through natural selection, they affect evolution. Environmental Variation: Environmental variations do not cause changes in the genome. Therefore, they have no effect on evolution. Genetic variation and environmental variation are two factors which bring alterations in the phenotype of a population. Genetic variations are caused by the changes in the genome of individuals. It mainly occurs during the sexual reproduction. The effect of the external environmental factors on the genotype makes changes in the phenotype in environmental variation. Only genetic variation has an effect on the evolution. The main difference between genetic variation and environmental variation is the mechanism by which each variation arises. 1.”Genetic Variation.” Boundless. N.p., 26 May 2016. Web. Available here. 10 July 2017. 2. Bailey, Regina. “The Importance of Genetic Variation.” ThoughtCo. N.p., n.d. Web. Available here. 10 July 2017. 3. “Environmental variation.” BBC – GCSE Bitesize. N.p., n.d. Web. Available here. 11 July 2017.